A study led by Drs. Christelle Not and Benoit Thibodeau from the Department of Earth Sciences and the Swire Institute of Marine Science, The University of Hong Kong, highlights a dramatic weakening of ocean circulation during the 20th century that is interpreted to be a direct consequence of global warming and associated melt of the Greenland ice sheet. This is significant, as reduced circulation in the North Atlantic can yield profound changes on both the North American and European climate, but also on African and Asian summer monsoon rainfall. The findings were recently published in Geophysical Research Letters. The Atlantic Meridional Overturning Circulation (AMOC) is the branch of the North Atlantic circulation that brings warm surface water toward the Arctic and cold deep water toward the equator. This transfer of heat and energy not only has direct influence on climate over Europe and North America, but can impact the African and Asian monsoon system through its effect on sea surface temperature, hydrological cycle, atmospheric circulation and variation in the intertropical convergence zone. Many climate models predicted a weakening, or even a collapse of this branch of the circulation under global warming, partly due to the release of freshwater from Greenland ice sheet. This freshwater has lower density than salty water and thus prevents the formation of deep water, slowing down the whole circulation. However, this weakening is still vigorously debated because of the scarcity of long-term record of the AMOC. Drs. 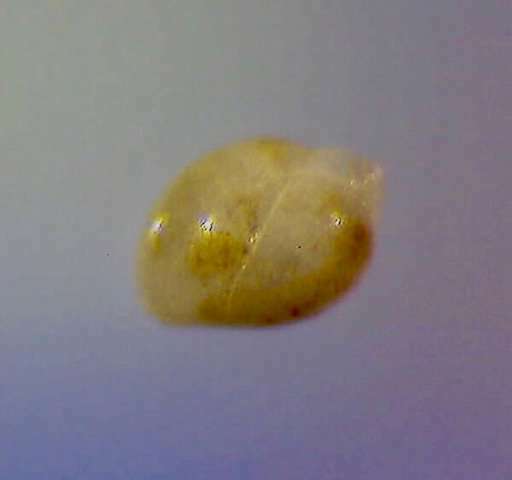 Not and Thibodeau used microfossils called foraminifera found in a sediment core to estimate the past temperature of the ocean. The sediment core used is located in the Laurentian Channel, on the coast of Canada, where two important currents meet. Thus, the strength of these currents will control the temperature of the water at the coring site, which implies that the temperature reconstructed from this core is indicative of the strength of the North Atlantic circulation. With their collaborators from the United States of America, they validated their results using instrumental data and two numerical models that can simulate the climate and the ocean. "The AMOC plays a crucial role in regulating global climate, but scientists are struggling to find reliable indicators of its intensity in the past. The discovery of this new record of AMOC will enhance our understanding of its drivers and ultimately help us better comprehend potential near-future change under global warming," said Dr. Thibodeau. Interestingly, the research team also found a weak signal during a period called the Little Ice Age (a cold spell observed between about 1600 and 1850 AD). While not as pronounced as the 20th century trend, the signal might confirm that this period was also characterized by a weaker circulation in the North Atlantic, which implies a decrease in the transfer of heat toward Europe, contributing to the cold temperature of this period. However, more work is needed to validate this hypothesis. "While we could ground our temperature reconstruction for the 20th century against instrumental measurement, it is not possible to do so for the Little Ice Age period. Therefore, we need to conduct more analysis to consolidate this hypothesis," said Dr. Not. warming would increase circulation and melt the coast of Greenland. As it did ~1200 years ago allowing the Viking colonization of Greenland and exploration of Nova Scotia/Newfoundland. The coast of Greenland remained warm for perhaps 400 years. Warm enough for the cultivation of grains and the raising of dairy cattle. Today the Danes of Greenland are lucky to raise a few cabbages (for which they are grateful). Otherwise the "climate" remains too cold to do anything else. 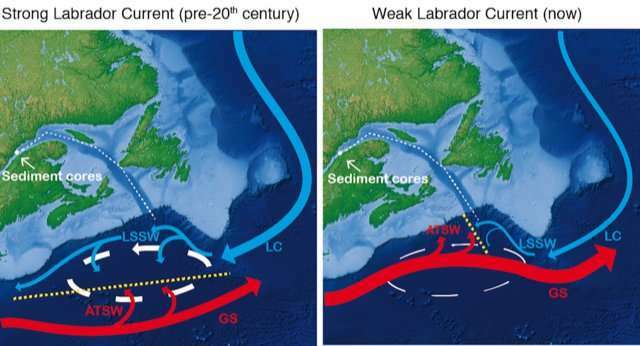 So, wait, there is not more, but less cold water coming down in Labrador current? Isn't this exactly the opposite from the old conventional prediction, that global warming and increased ice melt will cause more cold water to come from the Arctic, perhaps even blocking the Gulf Stream? So they really have no fcking idea. No. This is exactly the mechanism that the models show. Normally, the cold water becomes saltier as it moves north (https://blogs.ei....-stream/ ) and sinks as part of the AMOC. However, the melting ice is fresh water, so the water around Greenland is less salty and won't sink. So that part of the AMOC is slowed down or blocked. This means less cold water moves south and the AMOC is weakened. This has been the hypothesis for ~30 years, I think. This is just data that helps to verify the hypothesis. Oh my. how funny! Observing the primitive savages desperately prancing around the altar of ignorance. Howling their displeasure of reality.